Connecticut is one of the highest cost states in the country, rising to #2 in the 2012 Oregon survey and a consistent source of pain to the state’s employers. So we might expect that it would prove flexible to the point of surrender in the contentious area of exclusive remedy. Not so. The state Supreme Court recently barred a factory worker from accessing tort liability in a case involving what appeared to be extreme employer misconduct. Rajanikant Patel worked the night shift as a machine operator for Flexo Converters, a manufacturer of paper bags. He was injured while trying to remove a bag that was jammed in the machine he was operating. He claimed that the machine guard had been removed and that his supervisor ordered him to reach in and remove the bag. Patel further claimed that the supervisor would not allow him to shut off the machine and threatened to fire him if he fell short of his quota of 90 bags per minute. [I will think of Patel every time I am asked the inevitable question, “Paper or plastic?”] Patel did as he was ordered and suffered the consequences, although the court ruling does not specify the extent of his injuries. To pierce comp’s exclusive remedy shield, Patel must prove two distinct things: that his employer acted in full knowledge that he would be injured in carrying out the task and that his supervisor acted as an alter ego of the corporation. On the first point, the defense denied Patel’s version of the event, claiming that there was no substantial certainty that removing the stuck bag would injure Patel. On the second, and in this case more compelling point, there was no evidence that Patel’s supervisor was an “alter ego” of the corporation. speaking, have no separate existence from the alter ego who controls and dominates the corporation’s affairs. Connecticut has set a high standard for piercing the comp shield of exclusive remedy. This is not necessarily a bad thing, but it does raise a potential issue of fairness. Would the exclusion include egregious and potentially criminal acts by a supervisor: for example, a supervisor orders an employee to ignore standard safety procedures, using the threat of termination, and the employee is severely injured or even killed as a result. According to this ruling, as long as a “mere” supervisor directed the employee, and as long as the supervisor was not explicitly directed by company owners, the latter cannot be held accountable. 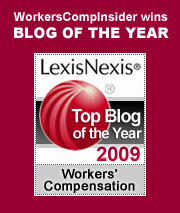 Comp remains the only remedy for the injured worker. There may be enough ambiguity in Patel’s situation to justify the retention of the comp shield, but it is not difficult to imagine a situation where exclusive remedy shields a company from what should be the core responsibility of providing a workplace free from unusual risk of injury. Patel may have been injured due to the wilful intent of his supervisor, but the court has ruled that his only recourse is comp. In Connecticut, “exclusive remedy” comes with a hard edge that basically cuts one way, in the direction of the state’s hard-pressed employers. Health Wonkery – Sarah Sonies and Jennifer Salopek have posted Health Wonk Review: Rhetorical Question Edition at Wing of Zock, covering such topics as such topics as costs, insurance, policy, money, and more. Get your fix of health wonkery now – the next edition won’t be until mid-July. There’s an App for That – NIOSH recently announced a new Ladder Safety smart phone app, saying that “This new app uses visual and audio signals to make it easier for workers using extension ladders to check the angle the ladder is positioned at, as well as access useful tips for using extension ladders safely.” it’s free and available for iPhone and Android devices. Health Reform updates – For health reform updates with a slant to the impact on workers comp, you can’t do better for a guide than our friend Joe Paduda’s informed commentary on his blog, Managed Care Matters. His most recent post on the topic: Implementing health reform, random report 1. If this is an issue on your radar, check back with him often. Massachusetts employers take note – Employment law attorneys Paul G Lannon and Matthew Mitchell post that Massachusetts employers may be liable to out-of-state employees misclassified as independent contractors on JDSupra Law News. They look at a decision issued May 17, 2013, Taylor v. Eastern Connecticut Operating, Inc.. They offer several lessons employers should take from this ruling – first and foremost being awareness that Massachusetts independent contractor and overtime pay statutes may apply to non-residents working outside the state. Lead-poisoned workers – At The Pump Handle, Celeste Monforton provides accumulating evidence that thousands of workers are poioned by lead each year, and a preponderance of those who are sickened are hispanic workers. The exposure is highest in battery manufacturing, secondary smelting/refining non-ferrous metals, and painting. She cites recent related cases from OSHA inspections and violations as well as a recent report by the California Department of Public Health, along with the most recent national assessment. More on Lab Safety – Following up on yesterday’s post about academic lab safety, we point to this article in Chemistry World on Laboratory Safety Goes Digital. The article talks more about the Dow Lab Safety Academy. From the “Bad Idea” file – Reports from Japan say that some companies are using banishment rooms as an alternative to termination. Later this month, UCLA’s chemistry professor Patrick Harran will face four felony charges in the laboratory death of his 23-year old research assistant Sheri Sangji. Harran is pleading not guilty to charges that revolve around his alleged failure to provide protective equipment and clothing, failure to provide training, and failure to correct unsafe working conditions. By way of background: In December 2008, Sheri Sangji was working with t-butyl lithium, a substance that ignites on contact with air. A drop spilled on her clothing causing an instant conflagration. She suffered second and third degree burns over 40% of her body, and died 18 days after the fire. The judge is right in using the word “unique.” Employers rarely face criminal charges for worker deaths. Generally, in all but the most egregious circumstances (and even then…), workers comp is the exclusive remedy for employee grievances and OSHA is the usual path for safety violations. In this case, a fine was imposed on UCLA. The Harran trial will be watched closely by many in academia – it’s a painful situation all around. The best possible outcome of this tragic situation would be a heightened focus on lab worker safety – and it appears to be having some effect in prompting greater industry/education partnerships to heighten safety. Case in point: the recently launched Dow Lab Safety Academy. New Health Wonk Review – Jason Shafrin has posted Health Wonk Review: Jeopardy Edition at Healthcare Economist. Put your health wonkery to the test. Cost shifting – A recent study by NIOSH researchers reports that many work-related injuries treated in emergency rooms aren’t being billed to workers comp. The figure approaches 40%, according to Celeste Monforton, who discusses this study in a post at The Pump Handle, Hefty portion of work-related injury costs not paid for by workers’ comp, others picking up the tab. “The analysis involves four years of data from the National Hospital Ambulatory Medical Care Survey (NHAMCS), a representative sample of U.S. emergency room visits. An estimated 458 million emergency department (ED) visits occurred between 2003-2006, based on the representative sample of 146,296 cases. The researchers specifically examined the subset of emergency room visits which were coded as a work-related injury or illness.” She notes that while not all workers are covered by workers comp, other may prefer private insurance out of fear of some disciplinary action. The impact of the study is enormous, both in terms of the economic cost-shifting implications and the accuracy or work-related injury data. On the case – Joe Paduda looks at The next revenue-generator for work comp profiteers. The Modern Claims Adjuster – At Risk & Insurance, Peter Rousmaniere looks at the image myths vs reality of the modern claim’s adjuster, and in the process, offers some clues as to what a savvy TPA shopper should be looking for in measuring performance. Patriot Coal – Trouble ahead: What the Patriot Coal ruling means for the future of Southern West Virginia’s coalfields – Ken Ward talks about the recent federal bankruptcy judge ruling which approved Patriot Coal’s plan to dump its union contract and its retiree health-care plan. He looks at what this decision and other issues might signify about the viability of the industry. Defense Base Act – “The final withdrawal of U.S. military forces from Iraq in December 2011 may have brought to a decisive conclusion an almost decade long conflict in the region, but much remains in question when it comes to how U.S. Government Contractors are protected from tort liability should their employees be injured, become ill or die in country while on company business. U.S. corporations should be aware of which form of workers’ compensation applies to their employees should a work-related incident occur.” Michal Gnatek of the Lockton Companies offers a whitepaper: After the Fire: Status of Defense Base Act in Postwar Iraq. The Most Dangerous Job in the World? – How did 900 bus drivers end up dead in Guatemala City? – a riveting read about the mind-boggling dangers some workers face just to put bread on their family’s table. Risky Women – When it comes to women in the senior ranks, Lori Widemer says that the United States is lagging far behind most other countries. “The proportion of women in senior management in the United States paled by comparison to countries such as Russia, with 36% of all senior execs being women, and Thailand, which topped Grant Thornton’s survey with 45% of senior managers being women.” She looks at the tea leaves, and makes the case for Why Women Should Lead Risk Management in Risk Management magazine. Call for Evangelists – Annmarie Geddes Baribeau issues a call for more work comp evangelists to convert CEOs to the cause of worker’s comp. We agree – every organization’s priorities are set in the corner office and if you don’t have deep-rooted employer commitment to make comp a priority, it won’t be. First Responders – The Boston Marathon Bombings: Lessons Learned for Saving Lives – a video featuring first responders, sponsored by WBUR and Harvard in the Harvard School of Public Health’s Forum series. The cost curve is bending. Does Obamacare deserve the credit?